a division of Source Map, Inc.
What Makes A Promotional Map "BEST"? IMAGE: Customers gravitate to quality. Advertisers know that Image is a very important element in communicating quality to customers. Seattle's Best Map™ and NW Adventure Map™ have the travel industry's highest quality GIS map Print & Internet images for Seattle and the Puget Sound- from Whistler, B.C. to Olympia, WA. CONTENT: Pictures say a 1000 words. Attractions, Hotels and Restaurants that use display-picture Content to show-case their business to travelers, get more business. Seattle's Best Map™ combines PRINT & INTERNET Display Advertising, Logos, Text, Hot Links to Advertiser's web site, numerous accurate regional Maps, Air, Road, Rail and Sea Travel Routes, Video, and Interactive Internet to show customers, Who You Are, What You Do, Where You Are. NWAC's advertisers can use large Display Ads and High-Tech Maps to offer Compelling Invitations to travelers. DISTRIBUTION: Distribution of advertising is vital. Distribution is more than just printing volume: it is also Where, When and To Whom. Savvy advertisers want more than just the Downtown Core. They also want to reach customers who are planning their trip to Seattle from around the World, neighboring states, around Washington and regional travel centers. Seattle's Best Map™ not only blankets Seattle's Downtown Core, but can be found in more places outside Seattle where travelers congregate, than any other Seattle promotional map. NWAC invites your Attraction, Hotel or Restaurant to join with the Seattle Convention and Visitor Bureau & the Seattle Downtown Association in attracting more travel customers to YOUR BUSINESS! Contact NW ATTRACTIONS COUNCIL to reserve your space: (360) 479-8384. 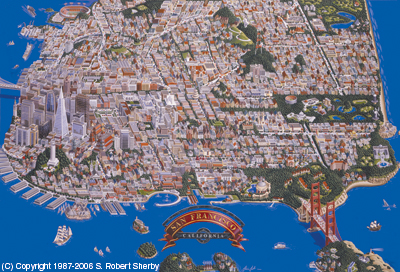 The Port Townsend Victorian History Map is the culmination of years of research, cartography and photography. It's purpose is to document and promote PT's rich Victorian History to the World in an effort to increase tourism to the entire greater Olympic Peninsula. Click Here to see a partial list of people that have been consulted by Northwest Attractions Council to obtain information and guidance for the PT Victorian Map. The most widely-circulated and most comprehensive illustrated Wall Map and Jigsaw Puzzle about Skiing in North America! The most widely-circulated and most comprehensive illustrated Wall Map and Jigsaw Puzzle about Racetracks in the World! The most attractive and value-packed guide map promotion ever created for ALASKA and ANCHORAGE!